Introduced in 2016, Truly Spiked & Sparkling is a great option for people who are looking for a way to enjoy the refreshment of adult beverages without consuming grain products or a lot of sugar. Since I am always looking for products to help keep my sugar consumption to a minimum, I was really excited when the Truly Spiked & Sparkling team offered to send me a few samples of this relatively new introduction to the adult beverage market to check out for review purposes. If you're looking for a refreshing adult beverage that is gluten-free and doesn't have a lot of sugar, you're going to be really excited to discover Truly Spiked & Sparkling! 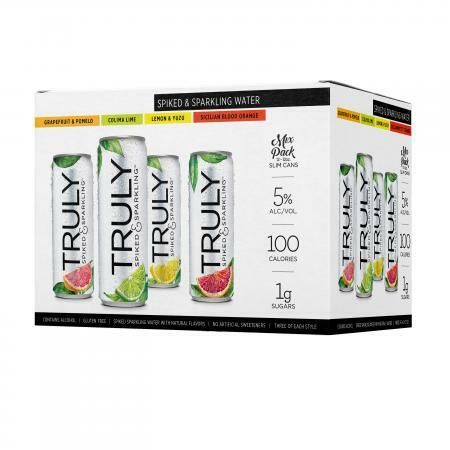 This great-tasting spiked sparkling water beverage for grown-up comes in a variety of refreshing flavors and has just 100 calories and 2 carbs per 12-ounce serving! If you count net carbs, you'll be glad to hear that this drink just has a single net carb per serving - one gram of sugar and one of fiber. I have tried four of the four flavors (all but blood orange), and enjoy the taste of all of them. I really like this beverage. I find that it is an excellent alternative to wine, beer, or cocktails. My review is overwhelmingly positive, both because it tastes great and it seems to be quite unique in the market. This is something that I will definitely continue to purchase for myself. Truly Spiked & Sparkling tastes so good that even people who aren't counting sugar/carbs or avoiding gluten likely enjoy it just as much as those who are. If you are a fan of sparkling water and you like fruity drinks, chances are that you will love this beverage. The flavors I tried all taste great directly from the can, though you can also get much more creative with this drink. It can be used to create mixed drinks in place of traditional sugar-laden mixes. The Truly Spiked & Sparkling website has mixology page with suggestions for using the beverage to create or enhance a variety of mixed drinks, including recipes for citrus sparklers, sangria, and several others. Rather than try the recipes on the page, I opted to experiment a little on my own. There isn't much I like more than sipping a good bloody Mary while watching a college football game, unless it's sipping a bloody Mary that has a bit of citrus flavor added in while watching the New Orleans Saints win a football game. Since I had both Colima lime and lemon & yuzi Simply Spiked & Sparkling flavors on hand and was thinking about ways to use them as a mixer, I decided to try adding them to my favorite bloody Mary recipe. Success! The result was outstanding. I tried a bloody Mary with just lemon, then I tried one with just lime, and they both tasted great. I had a little left of both flavors, so it only made sense to see what would happen if I poured them both in another blood Mary. After three bloody Marys, I was done with drinking for the day - but I'll definitely make this again. If you like this type of cocktail and enjoy a hint of citrus, I highly recommend trying this for yourself. The one caution I have is that Truly Spiked & Sparkling doesn't really have an obvious alcohol taste. So, it would be easy to forget that you are actually drinking adult beverages when consuming this beverage. Don't lose sight of the fact that this drink does contain 5% alcohol by volume, and avoid over-indulging. After all, it's always important to drink responsibly!